What hasn't ViCE confirmed? That MIA is actually coming? 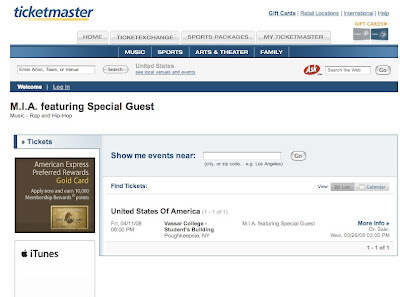 Or that ticketmaster is selling tickets? There are already posters up on campus advertising the MIA show on April 11. I know because I stole one to hang in my room. We only put aside a Very Small Number of tickets for off-campus people (which we have to do). The event is going to be ticketed, so it'll already be better than 100 Nights cause there can't be any over-crowding. Aaaaand we put this event in the largest space that the college would give us. We are making every effort to make this show safe, easy to attend... and pretty amazing. We've learned a lot this year, and we hope you all enjoy a killer spring concert from ViCE. Any questions or concerns, feel free to email vicemusic@vassar.edu and check our website: chooseyourvice.com for more info. ticketed? will it be hard for us to get tickets in that case? will there be enough for everyone who wants to attend? there will be a decent amount of tickets, but it will sell out. That means you have, have, HAVE to get them asap and not be lazy. they'll be on sale in the college center all next week.